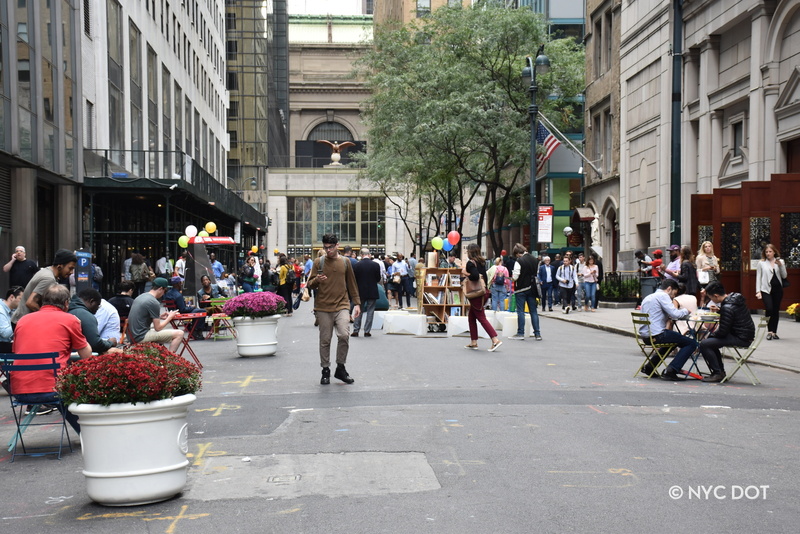 As part of the Greater East Midtown Rezoning effort, the City worked with neighborhood stakeholders to identify a series of public realm improvement projects which would be funded by future developement and deliver benefits to the gowing number of pedestrians in the district. The rezoning was approved in August 2017 and as an early action commitment, the City dedicated funding for the permanent design and construction of East 43rd Shared Street between Lexington and 3rd Avenue. Since then, DOT together with the Grand Central Partnership and local stakeholders have been working on a shared street concept to be implemented in interim materials. The interim plan, slated for installation this spring, will inform the development of the permanent reconstruction project in the coming years. What is a Shared Street? A Shared Street is a roadway designed for slow travel speeds where pedestrians, cyclists, and motorists all share the right of way. Vehicles are advised to drive 5MPH and the roadway is flush from building line to building line without the typical curb line grade separation. Shared streets can be designed and managed in a variety of different ways to balance the needs of all users while enhancing the safety, aesthetics, and overall experience of the street. 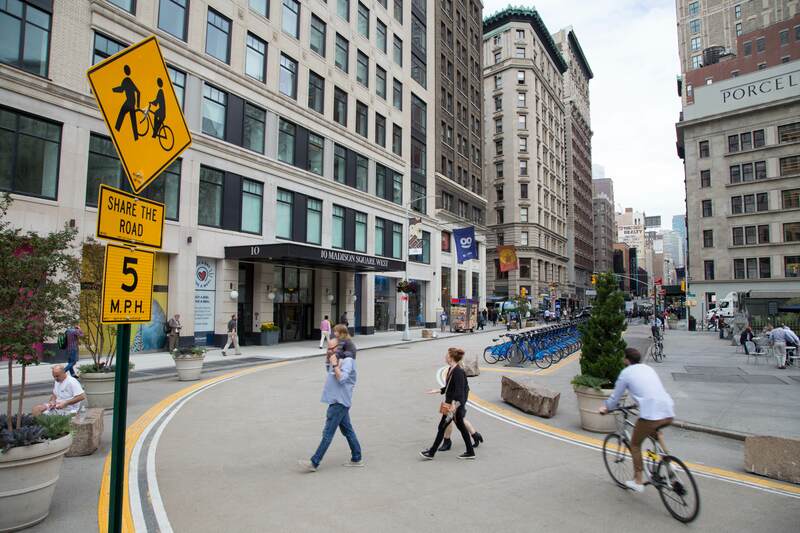 A recent example of a shared street in New York City is located on Broadway between 24th and 25th Streets in the Flatiron District. Vehicles are advised to drive 5 MPH and all users are instructed to share the road. 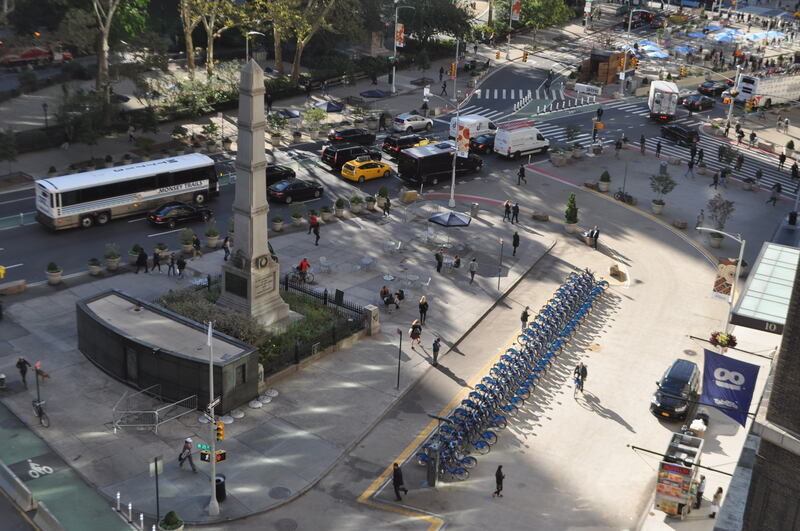 Why Shared Street on East 43 Street? East 43rd Street is a major pedestrian corridor between Grand Central Terminal and the United Nations Headquarters with thousands of people moving between trains, the 4, 5, 6, 7, S subway lines, and surrounding retail and office buildings. The block of East 43rd Street between Lexington and 3rd Avenue has a mix of uses including retail, offices, privately owned public space, the Church of St. Agnes, and operational loading docks. A shared street design would allow for all of these uses and users to coexist while providing additional pedestrian space, public space amenities such as seating and greenery, and enhanced safety. The design will accommodate the commercial loading needs of the adjacent buildings and businesses as well as the Access-A-Ride stop.